Justo Almario is a multi-instrumentalist at the highest caliber, Music Educator, Musical Director, Composer, Arranger and Clinician, Justo’s influences include John Coltrane, Antonio Carlos Jobim, Bach, Bartok, and Debussy, and most importantly Antonio Maria Peñaloza, a significant Colombian composer. Known as “Justico” in his native country, he could frequently be found jamming with the local, and much older players on the streets. A native of Colombia, Justo Almario was born in a Caribbean city called Sincelejo, and at age 11, went to Medellin, where his parents now live. The unfolding of his life events, and the musical opportunities he was given have been a dream come true. At age 16, he was recruited by Composer/Arranger Jose Madrid to travel to the US with the band Cumbia Colombia to showcase special arrangements of Colombia’s Folk Music. A few years later Justo visited San Antonio Texas, where he met Jazz Pianist/Educator Jorge Martinez Zapata who encouraged him to apply for a scholarship to Berklee College of Music, which he was awarded. It was during his years of studying at Berklee that Justo was discovered by Mongo Santamaria, who invited him to join his band. While touring with Mongo, Justo met Roy Ayers, a powerful entertainer, who asked him to record on the first of many albums: “Everybody Loves the Sunshine,” which would achieve gold record status, and whose albums are the most sampled to this day by many notable Hip Hop artists. Charles Mingus, Freddie Hubbard, Kenny Burrell, Herb Alpert, Andy Garcia, Cachao, Placido Domingo, Justo has performed, arranged, produced, and performed with these greats and many more. His own compositions are performed and recorded by some of the biggest names in Jazz today. 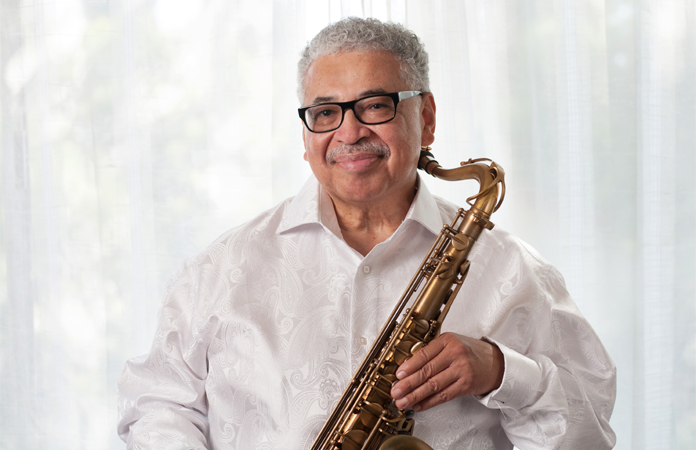 Since 2009 Justo has been the saxophone instructor for the Jazz Studies Program at UCLA. He continues to record, and performs at Jazz Festivals throughout the world.